This is one of the newest cookbooks on the gluten-free scene! The Everything Guide to Living Gluten-Free is written by Jeanine Friesen, of The Baking Beauties, and it is the perfect book to help you transition to a gluten-free lifestyle! I was lucky enough to get my hands on a Sneak Preview of this amazing book and was so impressed with how thorough it is. It covers everything you need to get started on a gluten-free lifestyle. It is full of tips, tricks, and tools to keep you on track and not feeling overwhelmed. Plus, it has 100 tried, true, and tested Gluten-free Recipes ranging from Breakfast, to Kid-Friendly Lunch and Snacks, Main Dishes, Sides and Salads, Slow Cooker, and Dessert Recipes! And coming from someone who has tested MANY of Jeanine’s recipes over the years, I can assure you that all of her recipes are amazing! If you are new to the gluten-free lifestyle, have been on this journey for a little while now, or know someone else who is just starting out living this way, this book is an invaluable resource for you. This is a wonderful tool and one that should be in every gluten-free kitchen. UPDATE: THIS GIVEAWAY IS NOW CLOSED! THE WINNER HAS BEEN CHOSEN AND HAS BEEN NOTIFIED BY EMAIL! Jeanine Friesen, the author of this book, is graciously giving away a copy of her wonderful book to one of YOU, my loyal followers! To enter to win a copy of The Everything Guide to Living Gluten Free, by Jeanine Friesen, just simply do One, Two, or all Three of the following. Just leave A SEPARATE COMMENT for each one that you do so that you can earn an entry for each. 2. Follow Cook It Allergy Free and/or The Baking Beauties on Facebook, or tell me if you already do. The contest will end on Wednesday, March 20th at 9am PST. The winners will be announced then. You must be at least 18 years old to enter. Getting started with GF, I am overwhelmed with information. I think this book would be perfect to help me get started! I follow both on FB and also from my fan page, Momma Butterbean’s Cookshack. I’d love to win a copy of this, especially for the traveling options as those can be the toughest! I’m still new to the gluten free lifestyle. Three people in my family are living gluten free and I could use all the help I can get. I have had several people tell me that I should go gluten free and my asthma would clear but I have been able to figure out how best to transition to a gluten free lifestyle. This book sounds like it would help me to easily learn how to this. It would be such a blessing to finally be free of asthma after 20 years. I am always looking for new GF recipes that the whole family can enjoy together. Would love to win! I already follow both cook it allerfy free and baking beauties on FB! I’ve just leant that I am GF and this book would be a tremendous help. Thank you for the opportunity . I’d love to have this cookbook. I’m just now starting to eat healthier, and gf is one of the ways I want to go! I follow you both on fb as Screaming Sardine. My hubby has gluten intolerance and dairy, wheat and anything else you can think of. I’m still new to the gluten free lifestyle. Any information is welcome. It would be great to have a book right on my counter to reference GF information rather than pulling it up on the iPad …especially since my kids usually have it! I’ve been following you on FB and love your posts! I shared this post on facebook . Shared this post with your friends on Pinterest. I’m following the Baking Beauties on Facebook. I bake and cook allergy free and am always looking to learn new info, tips and tricks. I love connecting with fellow allergy friendly cooks/bakers. I follow both on FB. Love the info shared! Have been eating gluten free sense Oct. 2012 and always welcome new and exciting ways to be creative in the kitchen. Shared this post on Pinterest, Facebook and following Baking Beauties 🙂 Thank you. This book sounds wonderful because it covers so many topics important to gluten free living as well as including recipes. Thank you for the giveaway. Definitely follow The Baking Beauties – love your page!! This book sounds and looks amazing… not only does Gluten bother me but Garlic does as well… I have just returned from a trip from the Dominican where I dined on Cabbage, salad and eggs for a week… would love to know what else I can prepare to take or cook as a change. Anything is better than Salad, cabbage and eggs.!! I would love to win your cookbook since my daughter has allergies, and I have a son with Autism Both of them might benefit by eating foods prepared this way. It would be wonderful to have recipes to guide me with meals for them. I follow Baking Beauties and also Cook It Allergy Free. Information on this chance to win a cookbook to cook gluten free was shared on facebook. I shared, i hope i can get a copy of this and one for sue too, both have major problems with gluten. Three of the four family members in my home are gluten free with me being the most recent addition. Health issues have all improved from this diet change. It is getting increasingly harder to find meals to make. Any help from this book would not only improve our choices but give us much more highly needed education as well. The information on dining out gluten free, finding gluten free personal care products, and recipes for the crock pot are my top reasons to have an interest in this new cook book! I would love to have this allergy book. It would be great to have more simple gluten-free recipes. My family follows a GF diet already and I’m always looking for new ideas. I already follow both on Facebook and have shared this link there as well. This would be such a treat to win a great new book!!! I have followed both Cooking Allergy Free and Baking Beauties. I have had Celiac Disease for a while. I would love more information on traveling and where to find gf restaurants. would love to receive a copy of your book … liked on facebook …. looking for some new and interesting gluten free recipes! interested in eating out tips. it is so hard with peanut, wheat, and egg allergies. also looking for great meal ideas for home. I follow both Cook It Allergy Free and the Baking Beauties. just shared your post. Thanks for the give-away! Sounds like a good book to share with family who maybe cooking for my celiac kids! I’m getting tested Friday for Celiac and my dietician believes if I don’t have it i do have gluten sensitivity. I’m going to need to make some changes to my diet and this would be perfect for me right now!!! 1) ‘Everything’–the wide scope–intrigues me.The fundamentals all in one resource. My husband is 100% gluten free. I am always looking for ways to get the rest of the family on the bandwagon. My family is about a month into finding out our daughter has Celiac. We are doing okay at home (mostly) but really need some tips for when traveling. Thank you. love your recipes. tried most of them posted.having two family members with gluten intolerance, they help to make meals enjoyable and normal again. being able to eat a variety of foods that are tasty is a bonus..
I’m still trying to figure everything out with my allergy, I think this would help me a lot. I am already a follower on facebook. I have emailed this to my mom who also has a gluten allergy. My friend Jeanine cookbook is fabulous! I follow both on Facebook! This cookbook intrigues me b/c it has everything all in one place! Would be a great source for me and my new husband to add to our collection! Shared on Facebook, Twitter and Pinterest! I just started eating gluten free. I would benefit alot from reading this book. I have recently had give up gluten and need help figuring it all out. Your book would help a lot. I pinned it on my Gluten Free page. I all ready liked Cook it Allergy Free on FB. I just liked The Baking Beauties on FB. I posted on my FB wall about the contest. I would like to win this cookbook. Thanks for sharing! I love that it has a little of everything. I am gluten sensitive and still learning how to cope. This would be great. I follow you both on Facebook. Hating to cook and trying to be gluten free is not a good combination–hoping the cookbook with help!!! I definitely need ideas in how to get my preschooler (and husband) used to beimg gluten free. I’ll be sharing on pinterest and following on facebook as well. I just pinned the contest info too. I would love to read this book to review for myself and others. I have loved the recipes that I have tried from her site! I shared this giveaway on Pinterest. I am new to gluten free so I am looking for any good literature on the topic and this book looks comprehensive and user friendly. Thanks for the giveaway! I am now following both Facebook pages. Thank you! I love to cook…but my daughter and sister have Celiac Disease so I am always looking for recipes that i can make that we can all enjoy! My daughter is graduating from college and getting married this fall…. she would really benefit from your cookbook as she starts her own gluten free traditions. This sounds like a book that we would benefit from. I have a son-in-law and a grandson that are gluten intolerant or maybe celiac and we still have a lot to learn. Oh the first line got me about the health benefits–so I can convince my non GF friends to follow a GF lifestyle. I already follow cook IT allergy free on FB and am now following @cookallergyfree on twitter @deedeethatsmee. I retweeted @deedeethatsmee and repinned : http://pinterest.com/debespins/pins/ (not sure how to get the url for a repin?, or a retweet for that matter!! but done. Thanks for the giveaway. My daughter is being tested for Celiac next week and I think this book would be very helpful. I’ve had an eye on this one for a while, I’d love to be able to try out some recipes! I’ve been diagnosed with SIBO a few months agio and started Fodmap diet…the biggest thing I learned from that was that eating gluten free changed my life,, .now that I feel so much better and have made other changes, I’m ready to really learn about gluten free living, especially the eating out part and reading labels! These have been the hardest things for me so far! It’s so hard to go out and I’d rather skip…hopefully this book will help get around those hurdles and make things easier and enjoyable for our whole family! I followed both sites on Facebook and shared the site on Facebook and Pinterest. So excited about this new book! My son has autism and is on the GFCF diet and I have been thinking of going gluten free as well (I am dairy free now). I think this book would help tremendously in the transition of the whole family going gluten free. I also am running out of recipes for my son so would love to try new recipes. New and more gluten-free recipes! and BEST of all, Ideas for parties and get togethers! I have been avoiding work get-togethers. I have “liked” both: Cook It Allergy Free & The Baking Beauties. shared your page on my Pinterest! liked both pages on Facebook! sooooo looking forward to reading all the back posts and getting new ideas!!! I am intrigued with the entire idea of gluten free cooking and the amazing health benefits that it offers. i have been looking for a good book to get me started and look forward to reading this one whether I win or not!!!! Thank you!! This book caught my attention since I’m celiac, and I’m trying to figure it all out. It looks like it would help give me some guidance on making this lifestyle work. I’d wanted to get the book, but our finances don’t allow it right now. I shared this on my Pinterest page. I have recently taken it upon myself to become Gluten Free to help with several symptoms I have had for a very long time. I do feel much better but I would love some guidence and help staying on the right track with all of this. I think that this book is a perfect fit for me. I like baking beauties and cook it allergy free on facebook. I posted this great contest on Twitter. You can find it under my handle: devratae! 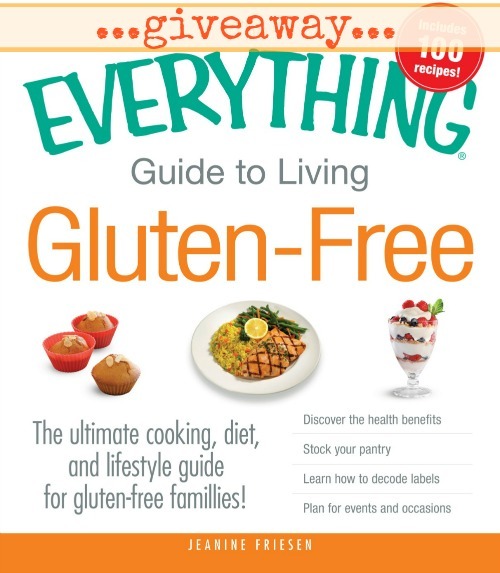 I’d love to have this book, because I didn’t even realize that I needed to find products that are gluten free. I just assumed everything was. Oh my, this would be very helpful indeed! I am very interested in this book because of the author 🙂 She shares wondeful recipes & tips on her site so I can’t wait to get the book. I now follow Cook It Allergy Free on Facebook & already a fan of the Baking Beauties. I followed both of you on Facebook. I can’t wait to learn how to make gluten free, learning to live a healthier life and a gluten free life. Looks like a great reference book for those needing to be gluten free. Would love this cookbook to help me with preparing gluten free meals for my grandchildren. I follow The Baking Beauties on Facebook. I also now follow Cook It Allergy Free on Facebook. What intrigues me? It’s a cookbook with gluten free recipes! I’m at such a loss most days as to what to cook or bake or eat….and I need help!! Please! And…thank you!! Can’t wait to read it!! Anything to equip daughter dear to live her life safe! I follow The Baking Beauties and love it. On Facebook. I shared the post on Facebook. My daughter recently was diagnosed with a glutton alllergy. Ths book would help me out so much as I really have no clue what I am doing and stressed out about it. I’m still new to the GF lifestyle, so the thought of having a great resource on hand would be so helpful. Follow on fb. Shared. Trying to heal skin issues a friend told me to try gluten free. A cookbook would be nice. I love the website the author has and would love this book since it looks like it provides great tips and recipes!